Get ready to catch the amazing jam rockers – Gov't Mule live as they come to The Wiltern on Tuesday 11th September 2018! It's going to be an unmissable night so be sure to book your tickets in advance and get on down for an evening you won't forget! The Southern rockers, Gov't Mule (But of course their dedicated fan base often call them Mule) have been taking to the stage from the very beginning and impressing their fans where-ever they go. With their formation almost 25 years ago, as a side project of The Allman Brothers Band by guitarist Warren Haynes and bassist Allen Woody. Together they have released so many incredible albums, a total of nine studio records so far plus more live releases and EP's under their belts and have become one of the most stable bands out there, performing across North America at huge venues and exciting events such as some of the biggest festivals in the country. Their sound crosses over funk, blues and rock and they have definitely crafted their own original trademark that everybody loves them for. 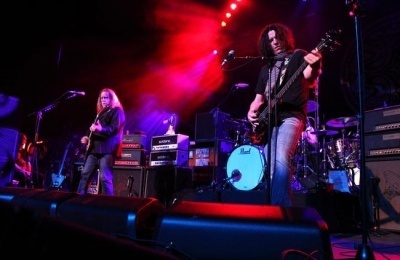 Gov't Mule have performed along side the likes of so many legendary artists and bands which has really helped to push them further into the limelight and given them the credit and feedback that they deserve. As well as this they have pushed themselves and covered famous songs by the likes of; Neil Young, Free, Traffic, Jimi Hendrix, Little Feat, Nirvana, Pearl Jam, Soundgarden, and Black Sabbath which has done the same. Come and catch the talented group as they take to the road once again and stop off for a live performance at The Wiltern this coming Fall!! Things are heating up, it's time to get yourself prepared for the unmissable show that is Gov't Mule!